Who's Who Underwater at Honokowai: Meet the honu. 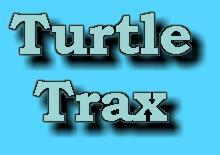 Table of Contents: The rest of Turtle Trax. Our prolog to summer 2002: How you can beat angina and dive again! Laniakea, Oahu: A magical place where the honu bask along with the tourists. Learn how you can volunteer to spend time with the turtles. Although I find this difficult, I am finally able to come back to Turtle Trax and try to move things along. Prior to losing perhaps the best friend I will ever have, I was already finding it hard to make changes here. I’d look at the site and feel overwhelmed, there is so much that needs to be done. The feeling hasn’t left, but so much has happened that I absolutely must do something here. I know many people arrive looking for information and current material, but it’s not easy to find here now. I do intend to fix this, but I have no idea when. As another dear friend commented recently, you pick something you can get done and do that, then repeat. Seems obvious, but so hard to do sometimes. At any rate, one thing I can do is post some of the recent good things that have happened. This honu is known by many names to others but by her original tag number 5690 to us. The Maui News refers to her as Maui Girl, and their story Maui Girl returns (July 26, 2011) describes how she is back nesting again this summer after skipping a year. Although we weren’t on Maui during her normal nesting time last year, we don’t think she waited until we showed up. As we’ve described here a few times, there is less and less of the algae that honu feed everywhere we’ve looked along the West Maui coast, and our theory is that she simply took longer to build up the energy reserves that she needs to lay eggs. We know she doesn’t make the 800 kilometer migration to nest, but she’s the result of millions of years of evolution, and her body has evolved to prepare her for that trip. Her first reported nest was made the night of July 9. Although we were already on Maui by then, we hadn’t been watching for her because she normally begins nesting in mid-May, and no one had reported any nests yet. We therefore only learned of this nest after the fact. Since we now had a reference date, however, we were expecting her back in two weeks, and as the newspaper story reports, she did indeed make what we thought was her second nest on the night of July 23. 5690 as she drops eggs on the night of July 23. This photo was taken while she was in her egg-laying trance, during which almost nothing can deter her from finishing. Prior to entering this state, she can easily be disturbed by lights and activity, causing her to abandon the effort and return to the sea. Alert readers will note that I wrote “reported” nest in that description above. The reason for that is a story that gives me a lot of personal pleasure and satisfaction. 5690 made another nest two weeks after the first, on the night of August 13, so we were expecting her to nest again on the night of August 20th. This is consistent with honu females, who usually make their nests spaced roughly two weeks apart. In the past, 5690 has been fairly reliable in her intervals, but has usually made seven nests instead of the normal four or five. She typically lays fewer eggs per nest, so her total production in a given year is about average. Honu aren’t predictable, however, and we certainly don’t depend on 5690 to keep to a rigid schedule. Her pattern has been to make a few false crawls on the night before she nests, so we always go to the beach on her 13th day, just in case she decides to nest early. Sure enough, on the night of the 19th she made a few false crawls, but we judged from her behaviour that she wasn’t quite ready and wouldn’t nest until the next evening. We gave up our watch at 1:00 AM and went home. 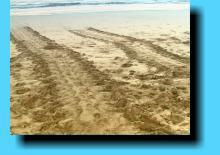 On the off chance that she had come back after we left, I went to the beach the following morning to look for tracks. I was completely caught off guard when I chanced upon what looked to me like an old nesting attempt. It was in a patch of beach morning glory and not obvious, which is probably why it went unnoticed. It also didn’t look big enough to be a completed nest. Since it was covered in old debris, I knew immediately that it hadn’t been made the previous night, but I was startled when I looked closer and saw a hatchling! Sadly, the little fellow had already died, but I now knew I wasn’t looking at an abandoned attempt, but a completed nest. The previously unknown nest as it appeared when I found it. The unfortunate little hatchling is circled in red. While the hatchling’s fate was lamentable in one way, in another it was most fortunate. Knowing that this was a nest that had already started to hatch, I contacted Glynnis Nakai of the US Fish & Wildlife Service, who excavates turtle nests as part of her job. Three days after hatchlings have emerged, Glynnis excavates to determine how many eggs there were, how many actually hatched, and most important of all, to find and free any trapped hatchlings. In this case, Glynnis responded immediately to my call, and at 5:00 PM Saturday evening I met her and Joanni Morris at the nest to help her excavate. After digging for a few minutes, we were delighted when she came upon two more hatchlings. One had died, but the other began wriggling at her touch and was clearly alive. I can’t describe how happy I was at that point, but as she dug a little further I grew ecstatic. The reason was that she found more live hatchlings. They had gotten wedged beneath some rocks and a root, and without our help, would never have reached the surface. By the time the nest was completely excavated, Glynnis had rescued 17 hatchlings. Including the little one whose sacrifice had saved the others, there were only three dead. What could have been an undiscovered tragedy turned into a brilliant rescue! The 17 rescued hatchlings, waiting in a bucket for their release. If their sibling hadn’t died on top of the nest, these adorable little honu would have died underneath the sand. A little later, just at sunset, a small crowd gathered round to watch the little honu scramble down the beach to the ocean. Glynnis Nakai, US Fish & Wildlife Services, places some of the rescued hatchlings on the sand. Since biologists don’t yet understand how hatchlings imprint their beach of origin, it’s normal procedure to let them reach the water on their own. One of the rescued hatchlings reaching the water’s edge. If this is a female and she survives, one day she’ll return to this beach to make her own nests. Counting backwards and assuming 5690 was keeping to her usual schedule, this nest was made on or near June 25th. That’s still a pretty late start for her, over a month past the time she has begun in other seasons. For years she has nested only on the stretch of beach at Kamehameha Iki Park, but she has made nests in other places in Lahaina in the past. The question now is whether she nested somewhere else earlier in the summer. We’ve looked but not seen evidence of that, and by now any early nests have hatched. She’s never nested after the end of August. We don’t even know if she’ll nest on September 3, which is the next date that matches her pattern. That would be Nest 6, which is not unusual for her—in fact it’s normal—but if she really started so late, this is not a typical summer. If she does come back, that would support the idea that the nest I discovered was her first or at most, second. If she doesn’t, there could have been two previous unknown nests, which would push her first date back to a more typical May 28th. Of course, if she doesn’t come back that won’t prove anything, but if she does we can be fairly sure there was at most one unknown nest—and if she comes back twice, which I think highly unlikely, we’ll be almost certain all of her nests are known. Watching an excavation and hatchling release is always enjoyable, but recall that I had found this nest because I was checking to make sure 5690 hadn’t fooled us and nested after we went home the previous night. It turns out that she had not, and so our 5690 evening had actually just begun. Our great friend and benefactor of the honu, George Balazs, had flown over from Oahu specifically to see 5690. For those unaware of the story, George has been leading marine turtle research in the Central Pacific for the US National Marine Fisheries Service since, well, almost forever. Back in 1981, George released a small yearling honu off the Big Island, with the single external tag bearing the number 5690. 19 years later, in 2000, he got a call from Maui that a turtle had nested on a Lahaina beach, and she had a tag: 5690! Since then, he’s naturally felt a special connection to this honu, and he’s taken a lot of pleasure from our reports of watching her make nests over the years. His job and location don’t allow him to be there on most of these occasions, but this year he decided to spend his own time and money to come over and see her again. (L to R) Glynnis Nakai, George Balazs, and Joanni Morris after the excavation of 5690’s first known 2011 nest. The bucket at their feet holds 17 rescued hatchlings. You can imagine George’s delight to have lucked into an excavation that saved so many of her hatchlings. This meant that he (and we) had the extraordinary experience of seeing the mother honu and her progeny all in a single evening. While this was an exhausting night—none of us are getting younger—it was more than worth it. It did, however, take some patience. 5690 was not beyond providing us with a little suspense. When we’ve been looking for her on other nights this summer, 5690 has been fairly consistent in making her first appearance about an hour and a half after sunset, around 8:30 PM. On this night, the one-shot chance that George had taken looked at first as though it wouldn’t pay off. Although he would have been happy with the unexpected hatchlings, it would have been a big disappointment if 5690 just didn’t show up. By 10:30 we were getting pretty anxious, although we weren’t about to quit waiting. Then, at 10:35, I saw her head pop up close to shore. She wasn’t about to let George down after all. I alerted George and Ursula that she was about to crawl up the beach, and we’d just managed to settle down to watch when she slowly emerged from the water. The moon hadn’t risen yet and it was hard to see what she was doing, but eventually we could tell that she was making her way up the beach. It took her 35 minutes for this first crawl, and although she eventually went back into the water, we were relieved just to know she was out there. Usually, it would be 30-45 minutes before she crawled out again, but continuing with breaking her pattern she showed up about 10 minutes later at the other end of the beach. Now, sea turtles are supposedly shy of bright lights when they come ashore to nest, but 5690 appears not to have read the manual. She crawled out right in front of two glaring floodlights on poles, behind which there was a loud nightclub complete with more flashing lights. As she moved up the beach, her behaviour became more typical of a nesting turtle, in that she veered towards the darkness provided by the shade of the vegetation. She crawled—and she crawled—and she crawled. Then she crawled some more. Once she was past the high-water line, she began moving parallel to the shore. She moved right over a lot of sand that I felt would have made a terrific nest. In fact, she actually had nested in that sand in a previous summer but not this time. About 100 meters later, she finally made it to the same patch of beach morning glory in which I’d discovered the nest that morning, and began to dig. Sometimes 5690 digs for a while and then changes her mind and moves elsewhere. Not this night. Most other nests are made with just me and Ursula watching, if anyone. Again, not this night. At times there were a dozen or more observers, and at least six people (including us) watched her from start to finish, more than four and half hours. As always, I felt privileged and exhilarated to witness the process, and I’m pretty sure everyone felt much the same way. I’ve no doubt, however, that George got a special thrill that no one else could experience as he watched the same honu that he’d released in 1981 making her nest on a Maui beach 30 years later. I’ve never created a page devoted specifically to 5690. Perhaps I should, but until I do I’m providing some links to some of the other places where we’ve written about her. Masha Kai is a female honu, resident at Honokowai, who had a satellite transmitter attached in the summer of 2009. Unfortunately, her transmitter failed sooner than we’d hoped and the tracking maps we did get showed that she never left the Honokowai area. Last fall, we did see her out on Reef 2, and it was obvious why her transmitter failed. Contrary to the report we’d gotten, the box was still attached to her carapace but the antenna was missing. That wasn’t the bad news, however. We were disturbed to see that Masha Kai had developed fibropapilloma tumors. This image shows not only the reason why Masha Kai’s transmitter failed, but also that she had tumors in her eyes and on her body. This summer, on our second dive, we saw Masha Kai again. She was in almost exactly the same place where we saw her in December, but this time the news was good. Her tumors had not progressed at all, and in fact looked to be regressing already. Compare this image to the one above. You can see that Masha Kai’s tumors haven’t gotten larger, and are showing signs of regression. While it’s uncommon, we have seen fibropapilloma regress this quickly before. It’s especially comforting in Masha Kai’s case because she was carrying a satellite tag and helping us understand the honu a little better. Of course there’s no connection between the transmitter and the tumors, but the tag does make her special to us. Mahalo nui loa, Masha Kai. Great site–great pics. Would love to witness a sea turtle laying eggs. We were so happy to find your blog because we are learning about sea turtles in class. This blog taught us many things about the sea turtles and how to care for them and protect them. One fascinating fact we learned was that out of 100 sea turtles, only one survives. This tells us that it is important to be responsible when we are on the beaches. Thank you for sharing your research and information. Have you ever had to rescue a full grown turtle? Thank you for responding and we hope you have time to visit our blog. check out the song “Turtle Power” by Kabbage at reverbnation.com/kabbage. One of the members of this group is from Maui. I think you will enjoy this song and if you do pass it on to others to enjoy. This is a wonderful blog and I particularly loved ready about 5690 its a beautiful story and I will be sure to check in again from time to time. It means the turtle migrated this summer to the nesting site of East Island in the French Frigate Shoals. The number identifies the honu as the 112th of the record 808 recorded this season. I will pass this sighting along to the Marine Turtle Research team in Honolulu. Thanks for the report. turtles are like my children, i love them so much!! (: if one was to die, i ould probably have to put my other ones up for adoption and kill myself as well, i wouldnt be able to live with such a pain! Turtles are cool, but people need to learn how to type correctly before they put stuff on here, or on any blog. hope for the best and soooooo sorry for your loss nice pictures by the way! Great page. I really enjoyed it. It was okay.No I take it back that was awesome. Yay! I love the little turtles. This is gorgeous, and the turtles are beautiful. I together with my friends were actually viewing the good suggestions located on the website and so immediately came up with a horrible suspicion I had not expressed respect to the web site owner for those tips. Most of the guys came as a result passionate to read them and already have truly been taking pleasure in them. I appreciate you for really being quite kind and also for picking out variety of remarkable subjects most people are really needing to be informed on. My personal sincere apologies for not saying thanks to earlier. Keep up the good work everyone! Bless you for helping these majestic creatures! Hi, I’m Hiroko Okuda from Japan. I visited Oahu last week. When I was enjoying snorkeling on the west coast beach close to the electric plant, I saw a huge sea turtle eating dead body of a squid. Surprisingly, he was using his flipper as a hand to grab the squid to bite it off into small piece that could be swallowed. On my way back to Tokyo, I read “the book of honu” and I found that honu is vegetarian. So I thought I should report what I saw at the west coast. Unfortunately, I did not take any picture. After this experience, I read “the book of honu” and now I know that honu are basically vegitalian. hi im gabbie and i love turtes. your picturesmade me want to get a pet turtle! they completly moved me alot. Really this is Amazing work which you people are doing to secure the marine food web and food cycle! I would like to join you’r Organization by voluntarily and it is my pleasure to become the member of you team . . .
turtles are my favorite animals i know so much about them. at school i get called smartical particals . i hope you enjoy turtles as much as i do. check out some books about them at your local library. learn and read its a great way to make your brain happy. Sunday before Memorial Day 2012, we sailed upon an 8 year old kemp ridley turtle who had been struck by a power boat in Old River between Ono Island, AL and Perdido Key, FL, about ½ mile East of the state’s line. A turtle expert came and picked it up but we have no information as to whom it was. It appeared that the boat had turned it over and the prop caught it on the breast plate where it penetrated, causing pectoral damage and possible internal damage as well. It survived for at least 10-15 minutes as it was swimming to shore; this was how long we had spent helping it to shore and looking for a phone and people to call. 911 ultimately connected us to the turtle specialist who resides in Orange Beach, AL or on Perdido Key. We did not realize how rare this turtle is in to this area. I found your website this morning and thought I should relay the information. I saw a documentary on Houston public television a few years ago about the mass harvesting of eggs and turtles on the Padre islands many decades ago. They said they would freeze the turtle for research purposes. Perhaps more information on who to call and metal turtle/animal guards should be required on all external propellor craft in regions where this can occur. 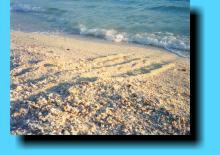 Aloha – I’m wondering who to contact on Oahu to work with sea turtles. I’ve been working with them in Clearwater Beach, FL for over 5 years, and we’re moving to Hawaii in July. We were hoping to be on Maui, but the State position ended up being on Oahu. Can you please provide information on who I could help with regards to turtles there? Love the site – thanks for all you do to educate people! Mahalo. I am sorry for the loss of your Jose. I applaud you and your efforts of taking care of these wonderful creatures. Keep up the great work. Mahalo for the kind words. On Oahu you can volunteer with Malama Na Honu. See http://www.malamanahonu.org/volunteer.asp for more information. you guys are still doing great work. keep it up. I’m still inspired by your efforts. You do not have to leave your real name, email address, or website to comment. Thanks to despicable spammers, however, comments must be reviewed before publication. If you prefer, you can send a private comment to the Webmaster.